Tesla’s EVs, radical and risky as they are, are a sustaining automotive technology: this means that traditional industry leaders will soon be able to compete with them, gifting private and business consumers world-wide more diverse, cleaner vehicle performance. But Tesla’s impact will also be felt by the oil market – this forced rush of investment by automakers into lithium-ion batteries will disrupt the transport fuel sector, and quickly displace established suppliers, oil companies. In the final chapter of his seminal work on the structure of technology disruptions, The Innovator’s Dilemma, published over 20 years ago, Clayton Christensen laid out his theories in a case study. The example he chose was that of the (then theoretical) high-performance Electric Vehicle – and he used a key concept to predict how it would it impact the auto market. If EVs were a sustaining technology – one which only improved the performance of established products – they would not transform the market. Incumbent auto-makers would be able to reassert themselves. But if they were a disruptive technology, one that brought to market a very different value proposition, it was possible they could upend the industry. His analysis concluded that EVs were in fact a disruptive technology, as they would eventually achieve the basic requirements of speed, acceleration and range, but offer a cheaper and simpler alternative eg for taxis, or buses. However, in 2014 Christensen recanted this analysis, under challenge from the example of Tesla, which had entered the mainstream market at the high-end, and not the low-end as most of the other examples of his work predicted. After a re-analysis his team concluded that although Tesla EVs were a radical and ground-breaking technology, they were ultimately a sustaining one, not disruptive after all. This new assessment then predicted that as soon as Tesla started to break free of its high-end niche, and aim for the mainstream, incumbent automakers would retaliate quickly and fiercely to avoid loss of market share and technological edge. This is because that against the threat of a sustaining technology, however radical, incumbents have the skills, resources and customer base to defend themselves effectively. This updated evaluation seems to be fitting current events pretty accurately. If EVs were a complex disruptive niche, most OEMs would continue to disregard the product. But most mainstream OEMs are scrambling to reinvent themselves as EV manufacturers . In total the industry is expected to spend a majority of its R&D budget (over $110 billion) in EV technology over the next 3-4 years, targeting large percentages of sales to be EVs by the early 2020s. These sums dwarf Tesla’s capital spend of about $2-3bn pa.
Whilst resisting the change to EVs was the prime strategy up until 2015-16, that no longer holds if your traditional competitors start reorganizing and rebranding themselves, and if new entrants such as Tesla and Chinese firms are taking the lead in the new technology. It was always likely that EVs in general, would exceed the basic performance requirements (speed, acceleration, range) for modern autos. The fact that these were a static target – mandated by decades of road design and legal limitations – made it practically inevitable as Christensen observed. Tesla’s disruptiveness is not, therefore, in the creation of the mass-scale lithium-ion battery for automobiles – mainstream auto firms can clearly now do this too. Tesla’s disruptiveness has come from actually – perhaps irrationally – taking the risk to invest in the organizational model and capital resources to manufacture mass-scale high-performance EVs. By doing so it is forcing the incumbent industry to defend their business models and adopt the new technology far more quickly than they would have – rationally – done. To Tesla, EVs are 100% of the business, and 100% of sales growth. To GM and Ford they were, until recently, an expensive sideline with no prospect of adding to margins or scale. Incumbent auto firms would never have risked Tesla-level expenditure and effort to develop the EV technology without extreme pressure: the market was too small and uncertain, the costs too high, and the draw on the resources and performance of the existing models too great. As Christensen notes they had rationally chosen not to invest. But EVs being a sustaining technology, now available to anyone with the dollars to develop them, OEMs either choose to play the new game, or sit it out as competitors, old and new, pile in. In 2012 the Tesla S largely solved the range and speed issue, and the newly-launched Tesla 3 (almost) solves the price and fuelling-speed ones. From hereon in the general industry, launching numerous EV models from 2020 onwards, will complete this process. This will kick-off an arms-race of new technology development. And the EV powertrain, it turns out, now it has arrived in a mature commercial form, provides a suite of qualities that gasoline-fired engines cannot achieve: zero emissions, lower running costs, fast-improving fuel economy, flexible charging formats, and fuel-import independence for consuming economies. These new qualities are becoming more valuable over time to a growing range of consumers. Mass transit businesses with high fuel costs and sustainability targets are already adopting the technology quickly, especially in the Chinese market where EV technology leadership is a top priority to ease fuel import dependence. Likewise various governmental bodies at federal, state and city level with carbon emission targets and environmental health issues are now legislating towards the new technology. Whilst it remains uncertain how quickly an individual consumer will switch to this suite of performance improvements, it is already stimulating significant demand from large business sectors and national and regional governments. Thus, whether or not the individual consumer wants to switch to EVs for these benefits is becoming a moot point. The performance package of the cars of 2020 and beyond will offer all the inherent EV benefits as standard – the automotive market will compete to make this upgraded technology offer the new norm. In Christensen’s analysis this amounts to EV technology supply suddenly creating new market demand: overshooting today’s mainstream consumer needs perhaps, but providing valuable solutions for a variety of other private and public transport markets. The general consumer is thus gifted a windfall of new features from the intensity of investments made by industry leaders. This investment intensity will likely also widen the technology performance gap between EVs and ICE vehicles, especially in resistant markets such as the US where attempts to relax ICE fuel-economy standards will weaken ICE technology further. This is best all summarised using Christensen’s scheme (see original charts below), and we have discussed the likely S curve adoption of EVs in more detail here. When applied directly to the Tesla / Li-ion battery situation (see composite chart below) it seems clear that the EV entry will stimulate the overall market to higher functionality eg to include zero emissions and new charging formats. However. the arrival of the transport-size Li-ion batteries looks certain to disrupt the transport fuel market: the Li-ion provides this new functionality whilst the older ICE technology simply cannot. In a nutshell – Tesla’s (sustaining) technology leadership will not upend the car industry. But that’s mixed news for automakers, and for Tesla. Into a slow-growing market for about 90 million new cars a year, Tesla’s dogged investments have introduced a group of new entrant EV specialists, and forced the auto industry to upgrade just to stand still – as well as continuing to invest in the current ICE technology. This is why the CEOs of Ford and Daimler for example are apt to complain about profit erosion, and why auto industry p/e ratios remain subdued. Frankly though, they would better serve investors and customers by getting on with the technology shift before it overcomes them. And as the charts show, the rise of lithium-ion batteries via EVs has now forced a disruptive change into the business that has had a century-long dependence on ICE technology: Oil. The majority of crude oil, over 60%, is refined into road transportation fuels. It is used in other modes of transport, and for some chemicals, but the engine of its growth is road transport fuels. The complicating issue for oil and gas companies is that the “new” technology that is disrupting their fuels business is in fact a vast, old adversary in a new guise – electricity – which has leapt the species barrier from power to transportation. Whilst lithium-ion batteries are the seen as the immediate threat, the reality is that once road transportation can be provided reliably and economically by electricity, the ultimate competitor is the world-wide electricity system. So, what are the choices for the now at-high-risk oil industry incumbents? 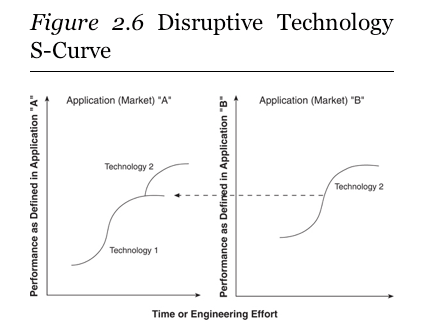 Christensen’s work notes, gently, that very few leading firms “have successfully established a timely position in a disruptive technology”. The reason why this is an enduring theme is because it relies on mathematics: the inability of large companies to continue to achieve growth targets by co-investing in smaller, non-core businesses (“resource dependence” in Christensen’s analysis). This inability continues right up to the point at which that “smaller” market starts to consume the central business. For oil, the “market” that is now developing to consume its core is the demand for low emission, non-oil dependent, cost-effective vehicles. And it’s huge dilemma is that it cannot service this market at all from a technological perspective. Now that Tesla solved the “cost-effective” EVs problem by triggering the whole auto market into manufacturing EVs, perhaps 20 years ahead of time, how can the oil industry respond? Having seen this before in many markets, Christensen offers several tactical options ranging from experimental defense, through Business as Usual (BAU), and on to radical overhaul. Many oil and gas companies have reacted to the rapid rise of alternative energies with the creation of small, experimental investments such as wind and solar businesses. In fact they have done this on and off for over 20 years as the threat waxed and waned. Each time, these small units suffered from competent management techniques: rational but limited investment leading to negligible impact on growth targets, and eventual closure. When a company has revenues of tens of billion of dollars, any new (experimental) business opportunity is unlikely to be able to contribute to this meaningfully. Nevertheless, Shell for example, one of the more experimental oil companies, has started to consider investments into electricity supply directly and the charging of new EVs on its forecourts. The mathematical size problem remains however: even with grand ideas for high margin electricity businesses, Shell is only planning to invest less than 5% of its capex base over the next 3 years into various ventures. Put another way, during 2018-20, Shell still intends to invest over 95% of its capex, or close to $75bn, into its existing capital stock and traditional businesses. 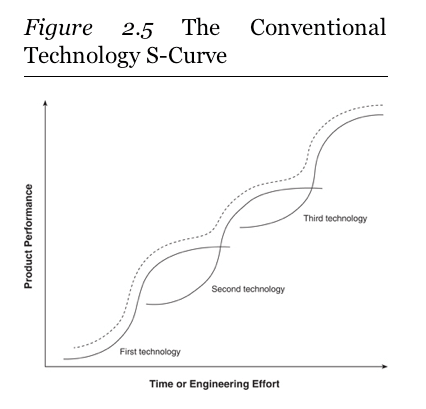 As Christensen notes, this is how rational, competent managements by-pass alternative technologies. And his analysis of multiple firms in various industries indicates that these small, experimental strategies within the parent firm rarely work. This is by far the most rational and politically achievable strategy – and being adopted across the board by the oil industry. The new playbook for international oil companies is a gradual exit from costly, high-carbon projects such as oil sands, and greater investment in faster-cycle, or less capital-intensive ones eg the US onshore, and gas fields. The problem is this falls straight into the trap Christensen warns against – assuming that the auto-industry switch to EVs is a sustaining technology problem for oil too, when in fact it is a disruptive one. The longer the oil firms pursue rational, good management techniques to satisfy what they believe their customers want, the higher the risk of their current oil-producing assets becoming stranded due to lack of demand for fuels. Oil major stock prices have flatlined over the past couple of years as investors consider the long-term prospects. Christensen’s final solution, which some firms in his study achieved, was to make a leap: to carve out an appropriately-sized autonomous business unit to tackle the disruptive technology, and at the same time avoid the shackles of the old business model. For the oil majors though – where to leap ? What is the technology they should be throwing a huge part of themselves into? EVs? Lithium-ion battery production? Electricity ? “Energy” ? Could Shell for example find the narrative power to restructure a large chunk of its business – say 30-50% – around novel adaptations of its midstream and retail assets? Rather than dabble with small investments in (low margin) power utilities, it could pull back from exploration, upstream operations and all long-cycle projects. As oil transforms to a cheap commodity it could then trade rather than produce, and repurpose its retail and real estate expertise to offer dual-mode (gasoline / electricity) energy infrastructure and services. But with strategy presentations already set in stone for the next few years, no such fundamental change in strategy is feasible, or likely even acceptable to investors. For sure transformative strategies have been flagged as long-term visions, but the industry disruption underway is unlikely to allow a decade or more for companies to carefully and gradually perform a neat conversion. The likeliest outcome, and the one most often followed in Christensen’s analysis, is BAU for the coming years. The oil industry has a hyper-rational, can-do culture that typically rejects radical change, and, now dangerously, embraces incremental improvement. So even with the growing risks of technology disruption abetted by national climate policies, the industry focus will remain steadfast on today’s oil production challenges. This was the original Innovator’s Dilemma that Christensen coined in his book: doing the right thing, the rational competent thing, is probably the wrong thing when confronted by disruptive change. 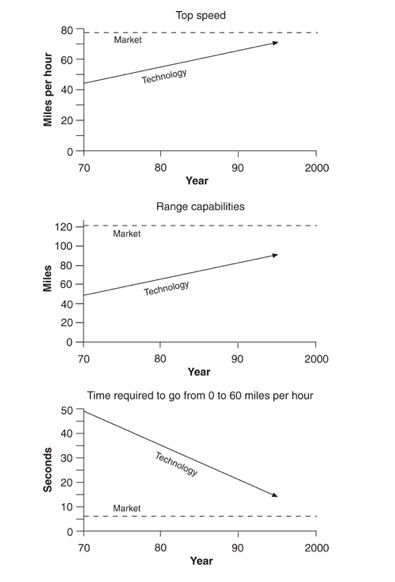 It’s interesting to read The Innovator’s Dilemma at a distance of 20 years. We have used Christensen’s schemes here not because they are certain to be right or are the only way to do so. But they do offer a useful way to confront the current auto industry upheavals objectively and in context with similar situations from decades ago. In the book, there is a whole index of once-dominant household IT names , for example, that have disappeared or retreated to the margins: Compaq, Commodore, Tandy, DEC, Wang; familiar names that have hung on via transformation – HP, IBM – and leaders that have thrived on disruption such as Apple. 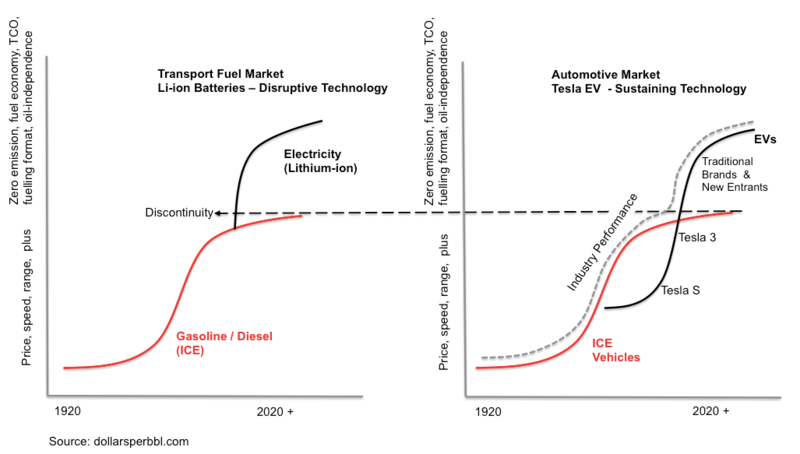 The advent of the mass scale lithium-ion batteries in EVs is exactly the S-curve technology disruption that Christensen identifies throughout the work – jumping from one market application (transportation) across to another (energy fuels). The roll call of oil firms in 2025 will almost certainly look very different to the one we take for granted today.